Let's look first at crabgrass. Most grassy weeds are undesirable weedy grasses that germinate and grow in lawns, but can lower turf quality and appearance. These weeds do not have the characteristics or growth habits that produce a quality lawn. Annual grass-type weeds are those that germinate from seed each year and die at the end of the growing season. Annual weeds are prolific seed producers since seed germination is the method of producing the next year's generation of plants. One of the most common and troubling grassy weeds. Yellow-green to a darker blue-green in color. Can be prostrate or upright growing. Multi-branched stems. Large crabgrass roots at the nodes. One plant can produce over 150,000 seeds. It doesn't make a good lawn because it doesn't take off until late spring or early summer and dies with the first heavy frost. Plants start off sparse but increase in number and size by end of the year. Can be difficult to stop once they start growing. 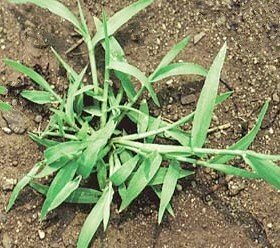 The U.S. and Canada have many grassy weeds with crabgrass being one the most problematic. There are two major species of crabgrass: smooth crabgrass (also called small crabgrass) and large crabgrass (also called hairy or common crabgrass). Smooth crabgrass is found mostly in the northern half of the U.S. and large crabgrass is found throughout the U.S. and southern Canada. 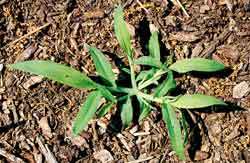 All crabgrass varieties are summer annuals that must come back each year by seed. It is a full sun grassy weed and will only tolerate very light, partial shade. It will not grow in shaded areas. Crabgrass was originally introduced into this country as a possible forage crop. However, it easily escaped cultivation and is now widespread throughout the country. 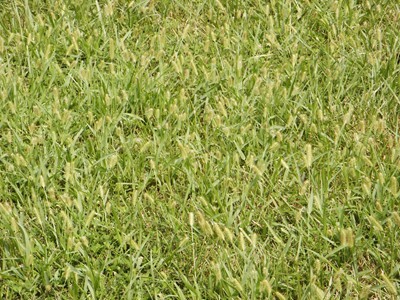 It is one of the most common and problematic weedy grasses in home lawns. It is also found on golf courses, parks, flower and vegetable gardens, athletic fields and any other place that seeds are able to germinate. Crabgrass is most at home in areas of thin or poor quality turf. The plants grow quickly and can cover an entire yard by the end of summer. Crabgrass is yellow-green in color with short, wide leaves. While the seedling look similar to other plants, they soon begin to distinguish themselves. In young plants, like the one in the photo to the left, the leaves are twice as long as they are wide. These young plants begin by growing prostrate with three or four stems branching out in a starfish pattern. As the plant matures the stems will curve in an upward direction. Each plant can produce as many as 700 new tillers (new leaf blades). At full maturity, each leaf will grow to be a few inches long. Crabgrass leaves have tiny hairs on both sides of the leaves. The roots are shallow and fibrous and do not reach the depth of many other grasses. Large (hairy) crabgrass will root at the nodes and can produce long stolons. Smooth crabgrass does not root at the nodes. The shallow root system works in their favor by absorbing as much water as possible before it reaches the deeper rooted plants. Frequent, shallow watering will cause crabgrass to flourish at the expense of other grasses. Less frequent, deep watering is better for your turfgrass, but will not neccessarily hinder crabgrass growth. 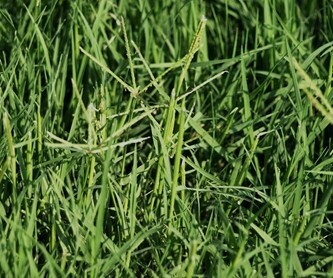 The photo above is of a mature crabgrass plant, while the photo below is of common bermudagrass. The leaves of bermudagrass are much finer and are darker in color. Crabgrass seed heads are finger-like spikes that resemble common bermudagrass seed heads. However, crabgrass seed heads are somewhat thicker. There are usually three to seven spikes that can either be folded up like a funnel or spread out in a whorl pattern. Each plant can produce as much as 150,000 seeds a year. Crabgrass germinates from seed each year when soil temperatures reach 55 degrees for five consecutive days. The blooming of forsythia in your area closely coincides with the germination of crabgrass seeds. Once the seed has germinated, crabgrass becomes difficult to control. Because of the prostrate growth habit, crabgrass can produce seed heads at mowing heights as low as ½ inch. Mowing your lawn at a height lower than is healthy for your particular grass will only benefit and encourage crabgrass growth. Crabgrass, like many there grassy weeds, do not like competition from turfgrass. Crabgrass grows best in poor quality lawns, lawns cut and maintained too short, lawns with disease or insects damage, and in high traffic areas. Lawns with thin or deteriorating grass will give the seed plenty of sun, heat and space for seed germination. A poorly maintained lawn will guarantee that you will have increasing problems with broadleaf and grassy weeds. If crabgrass is a problem, avoid fertilizing in late spring and summer. Especially avoid applications of high Phosphorus fertilizers. Phosphorus is essential for seedling growth and will only promote crabgrass establishment. The best method of keeping crabgrass and other grassy weeds out of your lawn is to build a thick, healthy, vigorously growing turf. The first step is to ensure you have the right grass type for your area. Increasing the grass thickness can be accomplished by overseeding, plugging or laying sod, proper fertilization and irrigation. Until the lawn thickens, grassy weeds will continue to be a problem. It is also important to mow your lawn at the highest recommend level for your specific grass type. This will shade the soil and make germination more difficult. Many cool season turf grasses can be mowed at a height of 3 to 4 inches. Depending on your grass type, see the Cool Season Grasses or the Warm Season Grasses Warm Season Grasses sections of this site for helpful mowing and planting information. You may find it necessary to use a preemergent herbicide to prevent the seeds grassy weeds and other weeds from germinating. The most effective and proven method of preventing crabgrass from starting is to use a preemergent herbicide. I can't stress this enough. If you want to prevent crabgrass from ever starting, you have to use a preemergent. Preemergents are an added ingredient in many spring fertilizer. The bags will be labeled "with Crabgrass Control" or "Crabgrass Preventer", etc. Make sure you spread the fertilizer at the correct nitrogen (N) level for your grass type. For help developing a sound fertilizer program, read the page on Developing a Fertilizer Program. A preemergent must be applied before the crabgrass seeds germinate in spring. Again, it MUST be applied before they germinate with only one exception, the use of Dimension preemergent will kill the crabgrass at very early seedling stages. I will describe this in better detail below. A preemergent (also spelled pre-emergent or pre-emergence) herbicide works by preventing cell division on young plants. A preemergent doesn’t actually prevent the seeds from germinating, as commonly believed. However, once the seeds do germinate, the chemical prevents the cells from dividing and the seed dies. In this way, the seeds are destroyed. An important note: Preemergents will have the same effect on most lawn grass seeds as well. Do not overseed directly before or within a few months after herbicide application or your seed may be ruined. If you have waited too long and the crabgrass begins growing, preemergents usually have no effect. However, there is one product with the trade name "Dimension" (Chemical name: dithiopyr) that will give some control of seedling plants for a few weeks after emerging from the soil. The effectiveness of some homeowner type preemergent herbicides is questionable. Some brands don’t perform as well as others. The effectiveness is also related to how it was applied, the amount and frequency of irrigation, amount of rain received, etc. Keep in mind, if applied too early, the chemical can breakdown too soon allowing mid to late season seeds to germinate. Other chemicals have a short life span and it must be reapplied in mid-summer. Therefore, timing of the application is very important. Outside temperature and soil temperature are important. Remember, crabgrass germinates when soil temperatures reach 55 degrees for five days in the top inch of soil. It is okay to water after the preemergent has been put down, but don’t over water or water too frequently. Frequent, heavy irrigation or heavy rain places maximum stress on these herbicides. Once the weeds are established, they are very difficult to control. Post-emergent herbicides labeled for grassy weeds will need to be used. Most products will require several applications for complete control. Products with MSMA or DSMA will control crabgrass as well as other weedy grasses. The Ortho company makes a product with these active ingredients. Add the correct amount of a “sticker/spreader” to the herbicide mixture for better adherence and absorption into the plant. There is also the herbicide quinclorac under the trade name “Drive”. This is now available to homeowners and sold by Ortho under the name “Weed-B-Gon MAX Plus Crabgrass Control Ready To Use”. It contains other ingredients to help control broadleaf weeds as well. The most popular preemergent for crabgrass and other grassy weeds is Corn Gluten Meal. Nick Christians, a turf specialist and university professor in Iowa, holds the patent. Corn Gluten Meal is sometimes marketed as an organic weed killer for broadleaf and grassy weeds. Although it actually holds little or no weed killing properties it is, however, an effective preemergent. It works by robbing the moisture from developing germinated seeds and seedlings. One main difference between chemical preemergents and corn gluten meal is the amount applied. Corn gluten meal must be applied between 10 to 30 lbs 1000/sq.ft. Generally, 20 lbs/1000 sq. ft. is the average for most lawns. Use more for severe weed problems. It does not require a license to use. Timing is important and it must go down near the time that seeds will germinate. After application, irrigate the corn gluten and allow a drying period. This is critical for effectiveness because it must absorb the surface moisture. In wet climates, such as the north western U.S., corn gluten meal may not be as effective. A second application can be made in the fall. Keep in mind, with corn being used as fuel for vehicles, corn gluten meal is rising in cost. Shop for the best price. Learn From the Mistakes of Others: Spraying your lawn with a a non-selective herbicide such as Round-up, etc is not an effective crabgrass control. It doesn't harm the seeds in the soil. Although it will kill all the grass and weeds it touches, the following year you will still have the problem with crabgrass and other broadleaf and grassy weeds that start from seed. For lawns containing 50% or more weeds with thin or very little grass, a non-selective herbicide can be used if you plan on seeding or sodding soon after. Don't wait too long to renovate or the weeds will become established and you will have to do it again. Each grass type has a preferred time of year when it should be planted. Read labels carefully and follow all label instructions. Note that MSMA and DSMA are not recommended for St. Augustinegrass, centipedegrass or carpetgrass. Foxtails are a summer annual grassy weed. They get their name from the seedhead that resembles a fox's tail. They can spread quickly in sunny areas but less so in shade. The same preemergents that control crabgrass will also control foxtails. Grassy weeds with characteristic cylindrical seed heads. Seed heads are 2-3 inch. Difficult to control once seeds have germinated. You will start to see foxtails as soon as the crabgrass weeds are well-established. The same preemergent that stops crabgrass also stops foxtails. Foxtails are a species of warm season, annual grassy weeds that starts from seed. It grows in full sun, but can tolerate very light, partial shade. It will not grow in shaded areas. It develops from a fibrous root system and has a prostrate to upright growth habit. 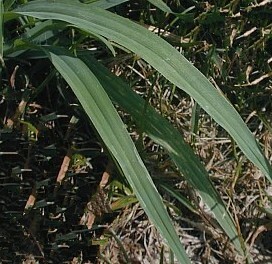 With mature plants, it is common to see the stems branching out at the base, remain prostrate for an inch or two and then curve upward at a 30 to 70 degree angle. Each plant can produce multiple stems that can easily grow twice the height of the leaves. The coarse leaves are a yellowish-green to a darker blue-green color. They can grow to 12 inches long and up to ½ inch wide. The leaves are flat and smooth. The widest part of the blade is at the base. The leaves have small silky hairs on the upper surface near the base. Foxtails are known for their characteristic seed head that has a foxtail-like appearance. The seed head is at the end of the stalk and usually extends several inches above the leaves. Mature plant can have a dozen or more seed heads and can produce thousands of seeds each year. Seeds germinate when temperatures reach 68 degrees and will continue germinating through most of the summer. Foxtails will die at the first killing frost. Giant foxtail is another foxtail species that grows 2-5 ft tall, but it cannot take repeated mowing. For this reason, giant foxtail is rarely found in mowed turf. Notice that the seed head of giant foxtail droops, while yellow and green foxtail seed heads do not. The primary way of preventing the establishment and spread of foxtail is to maintain a thick, healthy lawn. Maintaining your lawn at the tallest mowing height recommended for your grass type will help slow seed germination. Consistent, weekly mowing to remove the seed heads before they mature will also go a long way to deter spread. If you have only a few plants growing in your lawn, try removing them by pulling them up. The plant has a fibrous root system, however, some plants will root at the nodes near the base of the plant. If you have had problems before with foxtails, the best way to stop their development is with a preemergent herbicide. These preemergents are added to spring fertilzers. The same herbicides labeled for crabgrass will work on many other grassy weeds, including foxtails. 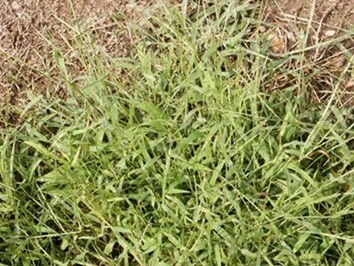 Preemergents are added to spring fertilizer and will be labeled "with Crabgrass Control" or "Crabgrass Preventer", etc. Always check the label before using, however. Once the preemergent had been applied, moisture in the soil will activate it. Fertilizers need to be applied correctly in the amounts needed for your grass type and time of year. Scotts fertilizer brand as well as a few others are good homeowner fertilizers. Bargain brands may not give you the control over grassy weeds that you would like. Since fertilizer applicatons are based on the Nitrogen (N) needs of the grass you will need to know how much to apply. Click on the link for helpful information on Developing a Fertilizer Program. Most preemergents are designed to last a few months before they begin to lose effectiveness. Not all active ingredients work equally well or have the same duration and homeowner varieties tend to last the least amount of time. This means that your timing will be very important. Important Note: Foxtails will germinate a few weeks to a month later than crabgrass. Something to remember when applying a preemgerent. Once the seed germinates, the herbicide chemical stops cell division within the seed, so the plant never develops. As a result, the seed dies. The preemergent herbicide label may list other broadleaf and grassy weeds that it controls. However, most are not very effective with broadleaf weed seeds. Post-emergence herbicides will be needed once the foxtails have become established. 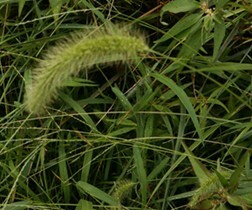 The herbicides containing the active ingredients MSMA or MSDA are labeled for many grassy weeds, including foxtails. Read the label carefully and follow all label instructions. MSMA and DSMA are not recommended for use on St. Augustinegrass, centipedegrass or carpetgrass. There is also the herbicide quinclorac under the trade name “Drive”. This is now available to homeowners and sold by Ortho under the name “Weed-B-Gon MAX Plus Crabgrass/Grassy Weeds Control. It is a "Ready To Use” formulation, meaning it comes already pre-mixed. It contains other ingredients including 2,4-D and Dicamba to help control broadleaf weeds as well. Nimblewill is a grassy weed that resembles bermudagrass. It is most prominent when growing in cool season grasses. Find information on identification, growth habits, and control methods. With each spring comes a surge of winter annual broadleaf weeds. Here you will find valuable information about these difficult weeds including growth habits, photos, and measures that can be taken to control them. Many of the most problematic broadleaf weeds are annuals. Here you will find specific summer annual weed information, with weed names, photos and control methods. Click here for weed identification and control of common broadleaf perennial lawn weeds. This page has detailed information on Canada Thistle, Mouseear Chickweed, White clover, Dandelion, Field Bindweed, Ground Ivy, and Common Mallow. This page contains more perennial broadleaf weed identification and control methods. You can find detailed information on Buckhorn Plantain, Broadleaf Plantain, Red Sorrel, Wild Violets, and Common Yarrow. If this page has helped you, be sure to click the G+ button above to let Google know.